I’m so excited to introduce you to Debbie Crothers today. Debbie is not only a fantastic clay artist, but she is known worldwide for her art, workshops, & online tutorials. I have been a fan of Debbie’s work for years and over the past 2 years have purchased many of her tutorials and I have thoroughly enjoyed every single one. Thanks for joining us today, there is much more fun planned from other polymer clay artists coming up in two weeks. Don’t miss it. Sign up for the emails here. And now … let’s see what Chris has to say! 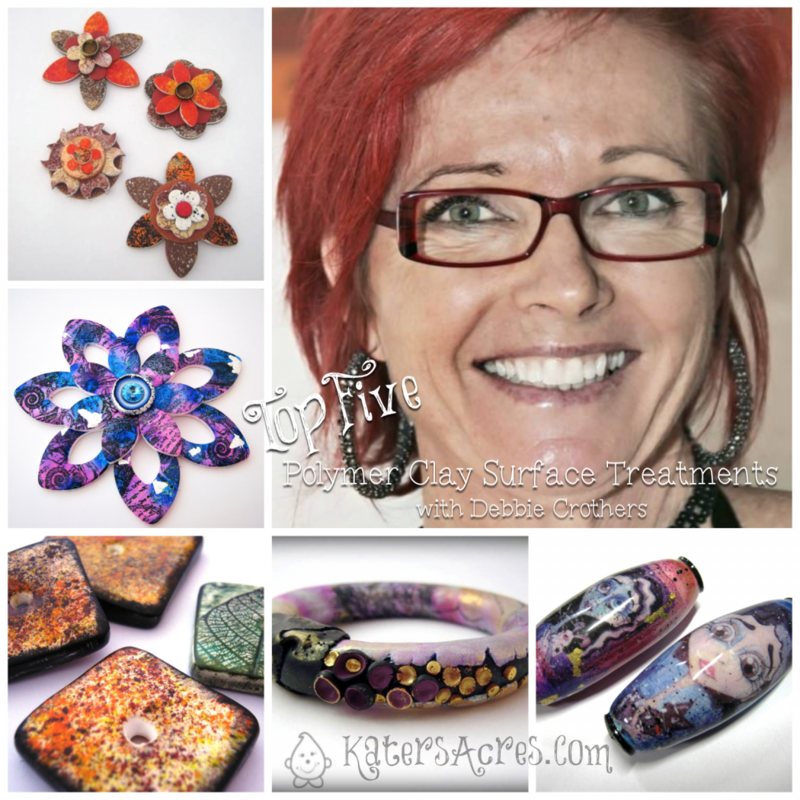 My absolutely number one surface treatment for polymer clay is foils….and who doesn’t love shimmery and shiny clay. I love to burnish it onto black clay and create dots – large, medium or small, whatever size, they always look amazing. I love creating cool accents from the scrap sheets once those little foil dots are removed as well. Run it thin through the pasta machine and use it for all sorts of surface design. Creating little cups with little foiled dots is always a delight and is another awesome accent to use in your creations. What about foiled bead caps…..oh I could go on forever. Definitely my number one surface treatment. I’ve used Jones Tones Foils and Lisa Pavelka Foils for this technique and had success with both. They’re relatively inexpensive to buy and are well worth it in my opinion. I’m yet to try Nail Foils but that could be another option for this technique. I am very much in love with this surface treatment and have dabbled with it on and off over many years now. There’s many different ways to transfer your images and many different papers to use as well. I love that fact that I can transfer images of my loved ones onto polymer clay – now you can’t get anything more special than that can you. My favourite technique is definitely laser based transfer and I get very excited about transferring images of artists work. White clay is definitely my favourite clay to use with chalk pastels…..and oh how I love those chalks…..hmmmmm yum!!! I’ve tried all sorts of different brands from the very cheap to the very expensive and all of them work beautifully so no need to spend a fortune to get a great result. I love the fact that I can mix the colours on the surface of my clay and create custom colour blends. I also love the fact that they change the colour of the white clay completely – it’s always a surprise in the end and that is the really exciting part for me. Chalks are incredibly versatile and I’ve been able to work with them in a variety of different ways so I never get bored with them. They are definitely a must have in my studio. I’m sure you’ve all seen the technique of adding gold/silver/copper leaf to your clay and then dripping alcohol inks to the surface – well I must admit alcohol inks on the surface of raw clay is pure magic. I actually love to create sheets of clay by simply adding alcohol inks and letting them blend together – you can create some beautiful tie dye effects and batik looks. I tend to use mainly Ranger Adirondak inks but have used a few of the Pinata’s and they all seem to work incredibly well. I haven’t noticed a huge difference between the two. My favourite is definitely the silver – it blends beautifully and again, surprises galore with this technique. My final surface treatment would have to be creating acrylic paint veneers. I’ve played around with many different brands of acrylic paint and have had great success with the majority of them. You can use a variety of paint techniques and colour blends. Playing around with the clay once the paint has dried can result in some pretty cool outcomes too and again, many ohhh and aahhhh moments. I’ve love working with some of the metallic acrylic paint such as the Lumiere range and Viva Precious Metal Colour. Life is exciting! It’s exciting for me because I get to do what I love every day – well nearly every day! My passion is polymer clay, in particular, teaching with polymer clay. Surface techniques draw me in and I find I’m always searching for new products to use with my polymer clay. I’ve been working with polymer clay now for about 7 years and it never ceases to amaze me. I’ve been lucky enough to be involved in a variety of community art projects and schools projects teaching a range of polymer clay techniques. I live in Geraldton which is located on the midwest coast of Western Australia. I have an incredibly supportive husband and three pretty awesome kids so really, life couldn’t get much better. Great article ! I am so inspired to go play now!! I sometimes forget to experiment and it takes a little push (usually a visual one) to help me try new things. The good thing is I have all of the supplies ready for me. CraftArtEdu.com is having a sale on PC tutorials this week too FYI. Great Cory! I love Debbie’s tutorials from CraftArtEdu – they are fantastic! I have rubbed some of my projects with various eye shadows and it makes a beautiful silk look and feel, shimmering surface and the colors blend and are gorgeous. I am sure it is similar to your chalk method. Eyeshadow is great for clay because it contains mica. In many cases eyeshadow is cheaper than mica and will give similar effects.